This is how the Ihrām garment to be worn by the man. Shaving or shortening the hair. This is how the Ihrām garment is to be worn by the man. The ghusl (bath) for Ihrām is a Sunnah (recommended) for males and females, even for women who are menstruating or bleeding after child birth. The Prophet (ﷺ) commanded Asmā bint ‘Umays to bathe after she had given birth to Muhammad Ibn Abu Bakr at Dhul-Hulayfah (near Madinah) whilst on their way to perform the Hajj, “Take a bath, bind yourself with a cloth [to avoid the spread of blood] and enter into Ihrām.” Reported by Muslim from Jābir (رضي الله عنه). So after the bath and applying the scent (for men only), one puts on the garments of Ihrām. 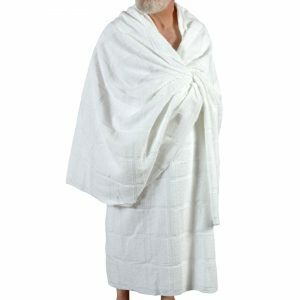 For a man, large cloth for the lower body (izār) and a large cloth for the upper body (ridā). A man is not allowed any garment that takes a form around his limbs such as: trousers, shorts, shirt, hooded cloak, and leather socks (khufayn). Furthermore, he must not cover his head with a turban, cloth or hat. He may wear anything that covers his feet so long as his ankles remain uncovered. It is allowed for a man to wear the Ihrām garments before he reaches the Meeqāt if he finds that is easier and more convenient for him (such as before boarding a flight). And then shortly before passing over the Meeqāt he enters into a state of Ihrām by uttering the talbiyah. As for the woman, she can wear whatever she wishes so long as her beauty is not displayed, i.e. a jilbāb. 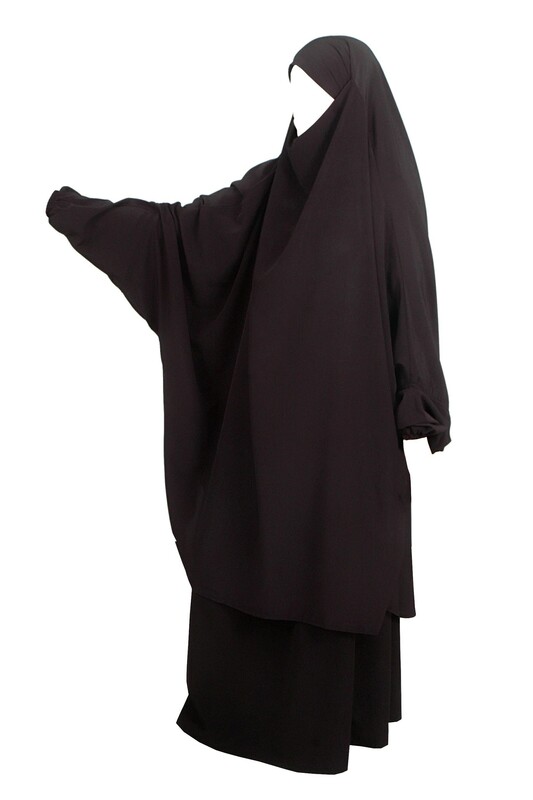 She is not allowed to tie a niqāb (face veil) nor is she permitted to wear gloves – but she can cover her face with her jilbāb or khimār by pulling the cloth down from her head over her face when non-mahram (unrelated) men are nearby. And there is no problem with the cloth touching her face. Other than this she must keep her whole body covered including her feet (with shoes or sandals), ankles (with socks), shins, forearms, ears, hair, neck, etc. Then one prays the obligatory prayer if it is the time for that. If not, then two rak’ahs can be prayed with the intention of praying the Sunnah for the completion of wudoo (ablution). Women who are menstruating or postpartum bleeding are not allowed to pray or perform Tawāf (or Sa’ee in ‘Umrah). The woman should fulfill the conditions of Jilbāb at all times – during ihrām she must not wear a niqāb or gloves. Sandals such as these are perfectly permissible for a man to wear as they leave the ankles uncovered. The Sunnah for men is to raise the voice with the talbiyah due to the hadeeth wherein Allāh’s Messenger (ﷺ) said: “Jibreel came to me and commanded me to command by Companions to raise their voices with the word of tawheed and the talbiyah.” (Muslim, Abu Dawood, Tirmidhee, Ibn Mājah, Nasā’ee) The raising of one’s voice with the talbiyah makes the signs and the oneness of Allah’s worship manifest. As for the woman, then she is not to raise her voice with the talbiyah or with any other type of dhikr because she is required to conceal that, and herself with modesty – her talbiyah should be with a quiet voice, and not be heard by unrelated men around her. On behalf of another: If a person is making ‘Umrah on behalf of someone else, then that intention is in the heart from the outset. And they should say at the Meeqāt: اللهم لبيك عمرة عن فلان – Allāhumma labbayk ‘umrah ‘an (state here the name of the person). Even if one makes the normal talbiyah without naming the other person but his intention was for that person, then the ‘Umrah is still counted for the one he intended. Children: The Hajj and ‘Umrah of children is counted, including children under the age of discernment (less than 7 years old). The accompanying guardian makes the intention in his heart that his child is to perform ‘Umrah. If it is a boy, the ihrām garments are placed on him – and the talbiyah is made on his (or her) behalf. So when the adults make Tawāf and Sa’ee, they can hold the hands of their children or carry them. If the child falls into an ihrām violation unknowingly or unintentionally there is no compensation or expiation to make. Meaning: If something prevents me from completing the rites of ‘Umrah such as an illness or a delay in the journey, etc. then I will exit from my state of Ihrām due to it. The Prophet (ﷺ) visited Dubā’ah bint Zubayr and he said to her: “Perhaps you intend to perform Hajj?” She replied: “By Allah, I feel a sickness.” So he said to her: “Perform the Hajj and make a condition, and say: اللَّهُمَّ مَحِلِّيْ حَيْثُ حَبَسْتَنِي.” The Prophet continued: “From Allah for you is that which you made an exception for.” Reported by Bukhāri and Muslim. As for the one who does not fear a hurdle that may prevent him from completing the rites, then it is not allowed for him to utter this condition. The Prophet (ﷺ) himself would enter Ihrām but not utter this condition. One should follow his example due to his say, “[I do this] so that you take from me your rites of pilgrimage.” Reported by Muslim. So he did not command everyone to utter these words of making a condition. Rather, he commanded Dubā’ah bint Zubayr due to the illness she was suffering from, and the fear that she may not be able to complete the rites of her pilgrimage. It is upon the muhrim (one in a state of Ihrām) to continue with the recital of the talbiyah when performing ‘Umrah from the time he enters into Ihrām until he (or she) is about to begin the Tawāf. When one is close to Makkah it is recommended to take a bath if that is is easy for him as the Prophet (ﷺ) would perform ghusl before entering it. A person should enter with submissiveness and humility and acknowledging the greatness and might of Allah, whilst being aware that he is the recipient of the bounty of Allah who has made it easy for him to reach the Sacred House, the Ka’bah. The tawāf starts and finishes at the Black Stone (Al-Hajr Al-Aswad). Then he heads for the House (the Ka’bah) aiming for the corner where there is the Black Stone so that he may begin his Tawāf. He does not say: “I intend the Tawāf..” This type of utterance is not reported from the Prophet (ﷺ). The place of the intention is in the heart. Wudoo is an obligation for Tawāf in the most correct opinion of the scholars, but it is not a requirement for Sa’ee. If it is not easy for a person to touch the Black Stone with his hand, then he must not push and shove to reach it because that harms him and harms others. His state of humility and submissiveness may depart from him and thus he leaves that affair for which he entered the Tawāf for, which is humility, and the worship of Allah – and perhaps due to this he may engage in false speech, argumentation and fighting. So it suffices that one raises his hand towards the Black Stone [in line with it] even if from afar – but he does not kiss his hand or touch his heart after that. Bukhāri reports from Ibn Abbās (رضي الله عنهما) that the Prophet (ﷺ) performed the Tawāf whilst on a camel, and each time he passed by the Black Stone he indicated to it. In a narration it states that: He indicated with what was in his hand and made the takbeer (i.e. he said Allahu akbar). 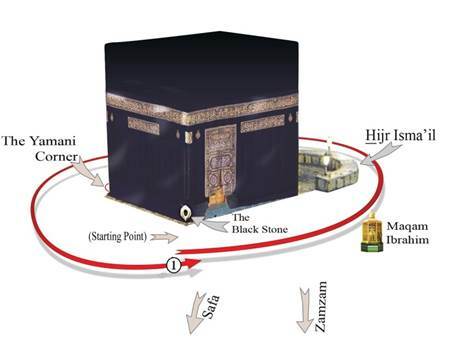 So after beginning with this, one turns to the left so that the House (Ka’bah) is on his left and proceeds forth. When he reaches the Yemeni corner, he touches it if it is easy for him without kissing [it is the last corner before he reaches the Black Stone]. Again he must not push and shove the people. Nothing of the House is to be touched with the hand except the Black Stone and the Yemeni Corner. That is because it is only these two that remain upon the foundations built by Ibraheem (عليه السلام), and the Prophet (ﷺ) did not touch except for these two corners. So each time one passes the Black Stone, he does as he did above and makes the takbeer. However when he finishes the seventh circuit, he does not indicate with his hand, nor does he recite the takbeer because his Tawāf has come to an end. In the circuits that he makes of the Tawāf, he may utter whatever he wishes from dhikr, supplications and Qur’an recitation. The Tawāf of the House and the Sa’ee between Mount Safā and Marwah are places for the remembrance of Allah. If one forgets the number of circuits, he recalls what he is certain of and finishes what remains. So if he is certain he has completed three but not sure if he has completed the fourth, he continues assuming he has already done the three (and not four). It is the Sunnah for the man during this Tawāf for ‘Umrah to place one side of his Ihrām garment under his right arm, thus exposing his right shoulder and arm, whilst keeping the left covered – and placing the excess cloth over the left shoulder. A man should uncover the right shoulder during the tawāf of ‘Umrah, and cover it up after Tawāf of the House. Furthermore, he should take quick short steps (known as ar-Raml) during the first three circuits of the Tawāf and not the final four. This is not necessary if he is accompanying his womenfolk, young children or the elderly. The Tawāf is seven circuits, beginning at the Black Stone (Al-Hajr Al-Aswad) and finishing there. It is not permitted to make one’s circuit cut through Al-Hijr, which is the area that is partially surrounded by a low semi-circular wall. When walking through the Haram one should avoid, as much as possible, crossing in front of those who are praying, by coming in between them and their sutrah if they have one. The sutrah is any object, a cubit-length or taller, (could even be a stationary person) just in front of one’s point of prostration whilst he is praying. This rule does not apply during congregational prayers where the imām is leading because the sutrah of the congregation is the sutrah of the imām. Then he returns to the Black Stone and touches it if he is able otherwise he does not signal with his hand towards it. So if he is not able to touch it, he makes his way to Mount Safā. He repeats this three times and after the first and second recital only, he should supplicate to Allah with whatever du’ā he wishes, for as long as he wishes. Then he descends from Mount Safā and walks towards Mount Marwah until he reaches the green lights. Once he reaches it (for men only), he runs quickly in accordance to his ability, without causing harm, until he reaches the next green light. Then he walks at a normal pace until he reaches Mount Marwah. He ascends it partially and faces the Qiblah and raises his hands and repeats what he did when he ascended Mount Safā. Then he descends Marwah and walks towards Safā, running when he reaches the first green light and stopping when he reaches the second green light. At Safā, he ascends and repeats what he did before of raising his hands in du’ā to praise, glorify and supplicate to Allah. The circuit from Mount Safā to Mount Marwah is one circuit and from Marwah to Safā is two, then back to Marwah is three. It is a must that seven circuits are completed. If done correctly, one will always finish at Mount Marwah. When one reaches Marwah at the end of the seventh circuit, he is not to recite the praises or supplications again. By reaching Mount Marwah, the Sa’ee is completed. Whilst walking between Mount Safā and Marwah, he may recite whatever he wishes from dhikr, du’ā and Quran. He may carry with him/her a du’ā and dhikr pamphlet (download here) to be read whilst performing Tawāf and Sa’ee. The actual ascent up the side of Mount Safā and Mount Marwah, the running between the green markers are both a Sunnah and not obligatory. Women should not run between the green markers. If a man is accompanying the elderly or womenfolk or young children and fears losing them in the crowds, he need not run. The Tawāf and Sa’ee can be performed on any floor of the Grand Mosque. However, in general Tawāf is quicker on the ground floor, though more crowded. On the upper floors it is less crowded but more time consuming. The Sa’ee is the same distance on every floor but can be more crowded on the ground floor. Zamzam water taps can be found at various locations in the Grand Mosque. If the congregational prayer begins whilst one is performing Tawāf or Sa’ee, he should join the congregation and pray with them. After finishing he carries on from where he left off. The menstruating and postpartum bleeding woman does not perform the Tawāf, or Sa’ee and she cannot pray but she remains in Ihrām until she is pure from bleeding – then she can complete the rites of Umrah. If her bleeding is non-menstrual and not from childbirth, i.e. it is istihādah bleeding (non-menstrual), or bleeding beyond the 40 days after childbirth, then she should wash the area, apply a pad, perform wudoo and complete all the rites of Hajj. Once the seven circuits of the Sa’ee have been completed, a man must either shave or trim his hair, and shaving is preferable for the man. As for the woman, then she must shorten her hair and not shave her head. From her hair when it is bunched together she removes a mere fingertip length of hair. It is obligatory upon the male if he chooses to shave that he shaves the whole head as that is what the Messenger (ﷺ) did. Likewise if a man is trimming his hair it must be from all over his head. With these acts the ‘Umrah is completed and he exits the state of Ihrām, and everything that was previously forbidden is now allowed for him. Read here what is disallowed for a Muhrim in four parts One, Two, Three, Four. Taking a bath/shower as one would from sexual relations and men apply fragrance. Women must not apply fragrance or scent. Wearing the garments of Ihrām, the izār and ridā (upper and lower cloth). The woman may wear whatever she choose under her jilbāb (but she cannot tie the niqāb or wear gloves). The utterance for entering ihrām at the appointed meeqāt. Then one recites the talbiyah often until he is about to begin the Tawāf. 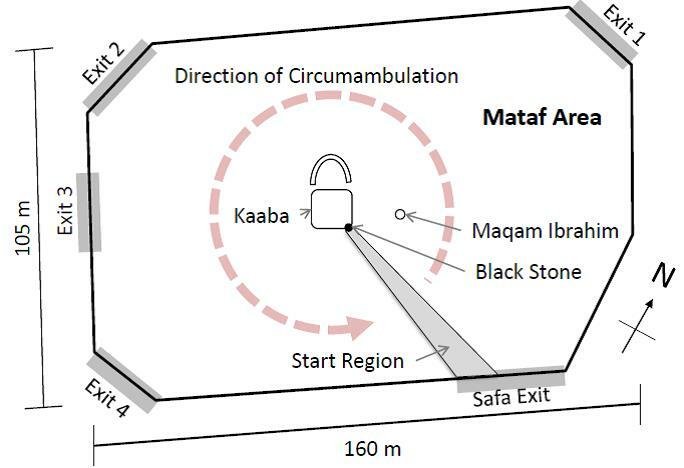 To make seven circuits of the Ka’bah (Tawāf) beginning at the Black Stone (al-Hajr al-Aswad) and ending at the Black Stone. Praying the two rak’ahs behind the Station of Ibrāheem. The Sa’ee between Mount Safa and Mount Marwah of seven circuits, beginning at Safā and finishing at Marwah. Shaving or trimming the hair for men. Shortening the hair for women. For a comprehensive audio on the topic of Umrah (or Hajj) scroll through this audio link and listen to lessons 5, 6 and 7 at SalafiSounds-umrah-hajj. Question: For our womenfolk who are menstruating and will only stop menstruating after they are due to leave Makkah for Madinah, what is legislated for them? 1. Enter Ihrām as normal and wait till she’s pure and make Tawāf then Sa’ee and shorten hair. If she’s not pure by the time you are to leave, stay behind with her in Makkah a day or two, or until she’s pure. 2. If you absolutely cannot stay behind and cannot return to Makkah, and she must leave; then she can make Tawāf as she is, in a state of bleeding (she uses a sanitary towel) – she makes the Tawāf followed by the Sa’ee. This is the fatwā of Ibn Taymiyyah, Ibn Bāz, Ibn Uthaimeen and Lajnah Dā’imah. She leaves this act close to her time of leaving in case she becomes pure. 3. She enters Ihrām, as normal, remains in Ihrām. If she’s not pure by the time you leave for Madinah, she remains in Ihrām and goes to Madinah with you. When she’s pure, you bring her back to perform the Tawāf, Sa’ee and shortening hair. Then go back if you wish to Madinah or home. Option 1 or 3 are best. Last resort is option 2. 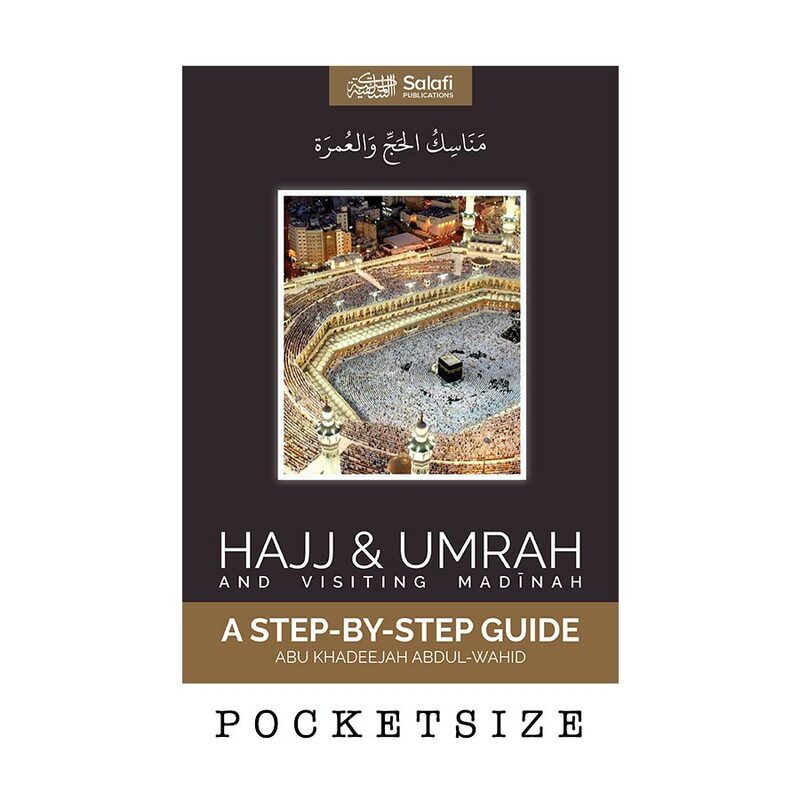 References: Manāsik al-Hajj wal-‘Umrah of Allāmah Muhammad Ibn Sālih Al-‘Uthaimeen and Manāsik al-Hajj wal-‘Umrah of ‘Allamah Muhammad Nāsir ad-Deen Al-Albānee, with additional references to ‘Allāmah Ibn Bāz’s Fatawa on the rites of Hajj and Umrah. 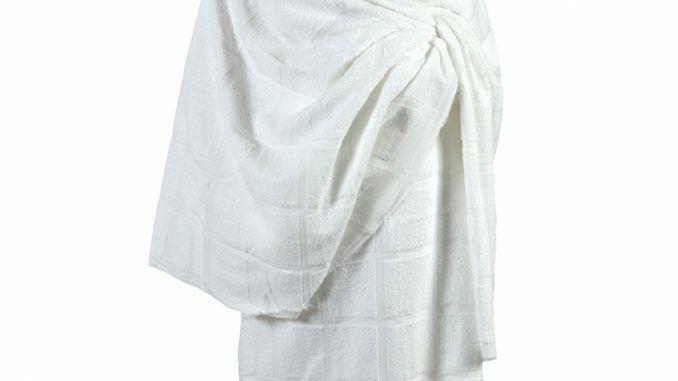 Visit premierhajj.com for an Umrah or Hajj package that is upon the Sunnah. NOTE: All images courtesy of google images (none of the images were produced by author). Alhamdu-lillah for this very useful piece.